A country in turmoil, the only remaining nation to not qualify for the FIFA World Cup from the CONMEBOL conference, a team that has never won the Copa América and the lowest-ranked squad in this summer's Copa América Centenario. But while Venezuela may be all of the above mentioned, the country's football team has managed to lift the spirit of their fans back home and across the world as the minnows have yet to lose in the tournament hosted by the United States and are now off to the second round of the competition for just the fourth time since 1967. With a 1-0 win over Uruguay, Copa América's most successful nation, and a 1-1 draw against Mexico, Venezuela's least surprising result was a 1-0 win against Jamaica in their opening match. Now, after sending the Uruguayan's crashing out of the tournament, the Vinotinto are looking ahead to their next challenge, a quarter-final match-up that will see them paired with Argentina, Chile or Panama, with the most likely scenario being a date with Lionel Messi's side. But despite a very tough match ahead, the Venezuelan's are staying positive. After all, the likes of Brazil, Uruguay, and Costa Rica have already been eliminated, while Venezuela marches on, looking to secure another shock result. A victory in their next match would at least equal Venezuela's best result in the Copa América, a tournament the nation has participated in for nearly 50 years. At the 2011 tournament which was in fact hosted in Argentina, Venezuela managed to place 4th after losing in the third-place match to Peru. 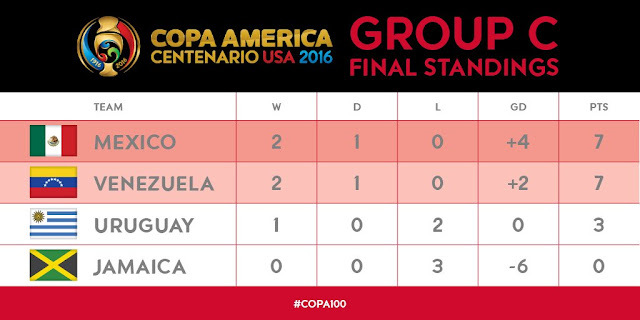 Whatever the result on the 18th of June at the Gillette Stadium in Foxborough, Massachusetts, there is little doubt that Venezuela has been by far the most surprising team of the Copa América Centenario so far and with little to lose may still have a miracle or two to experience in this summer's tournament.